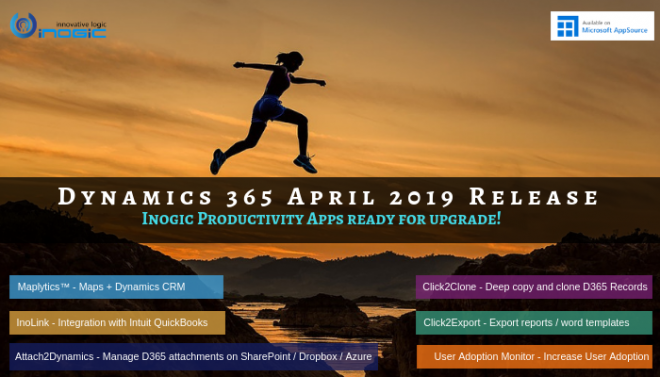 A few months back, we released a new version of Maplytics that supported the Dynamics 365 v9 and along with it came the ability to access Maplytics on Dynamics 365 App for Phones. After the release, the product team immediately started working on the next version and the core focus of this release was to not only make the Maplytics experience on the Dynamics 365 App for Phones and Tablets great but also add features that would make the life of a Field Sales or Service Rep easier! Proximity Search has been one of the most used features for field reps. The ability to find nearby Customer, Leads and Prospects has been a game changer for a lot of Maplytics users. Even though Proximity Search enabled users with an easy and quick way to find nearby records, the users wanted more. They wanted the ability to perform multiple proximity searches, so that they can find records in multiple proximity distance from their current location. We listened and are very excited to add the ‘Concentric Proximity Search’. Now, the users can enter up to three values, separated by a comma (,) and search records in concentric proximities of the current location. Not just this, the user can further filter the data based on the Proximity distance and also from individual Proximity Zones by using the filters in the ‘View Data; grid. While we were at it, we also added the decimal support for the Proximity Search as well. Now the user can also add decimal values with a scale of 2 for the proximity search. As we were also enhancing the mobile experience, this is also available on the Dynamics 365 App for Phones and Tablets. Creating optimized routes has always been a useful feature for the Field Reps. And with the ability to save and share the routes further makes this a must-have feature for every Sales and Service professional. However, previously when the users created a route, the route and plotted data were stored on different layers and the user had to switch between the Plot and Directions Card to view the plotted data and the route respectively. We noticed this, and came up with a way to merge both the layers and make it easier for users to have their data and routes on one screen! Now, when the user plots the data and then creates a route, both the plotted data and the route will stay on the map. This makes it easy for the user to add more waypoints to the route without switching between Plot and Directions cards. 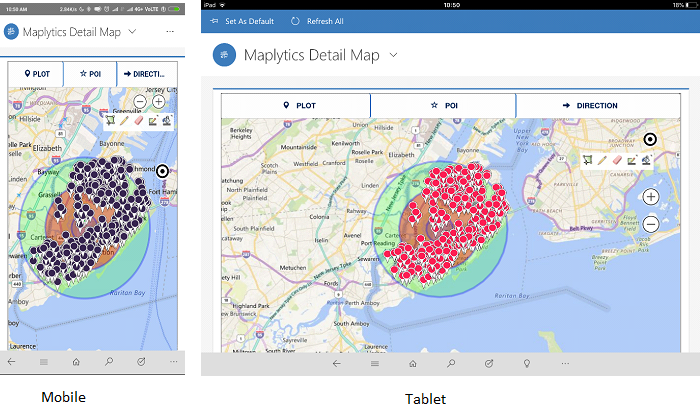 This has also been added for Maplytics on Dynamics 365 App for Phones and Tablets. While the Merged Route and Plot view solve the problem of having to switch between the Plot and Directions Card to add more waypoints to the route, there was yet another requirement that needed our attention. For example, the users create a route and hit the field for their appointments for the day. Now, a lot of times, the appointments are pushed, canceled or is over before the estimated time. Each of this scenario leaves the user with spare time on their hand and is inefficient for their performance. Previously, Maplytics users would just perform a proximity search to find the nearby records, but having to do this every time was something that we didn’t want the user to do. So, to solve this, we came up with an awesome feature that kind of brings the best of routing and proximity search together, and we call it ‘Along the Route Search’. This feature allows the user to define a value for the search and Maplytics will find all the records that fall in the defined proximity along the route. 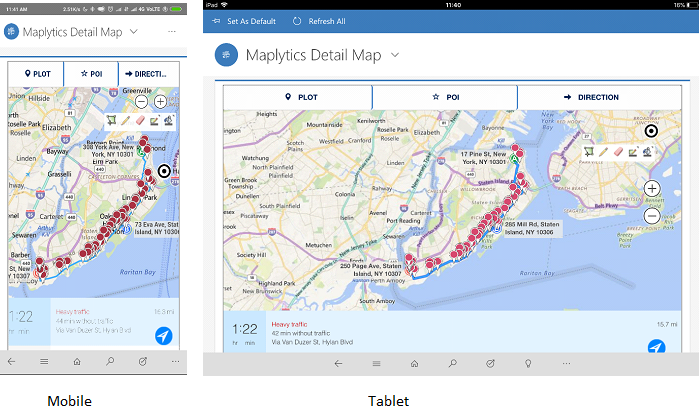 Along the Route Search is also available on the Dynamics 365 App for Phones and Tablets. Previously, for users to get turn by turn directions for the created routes, they needed to send the route links through email. This was something that affected the ease of use for Maplytics and in cases where the organization did not have the Server Side Sync enabled, this feature was redundant. To solve this, we added an easier way to access the route navigation links, not just on the desktop but for the mobiles and tablets as well. 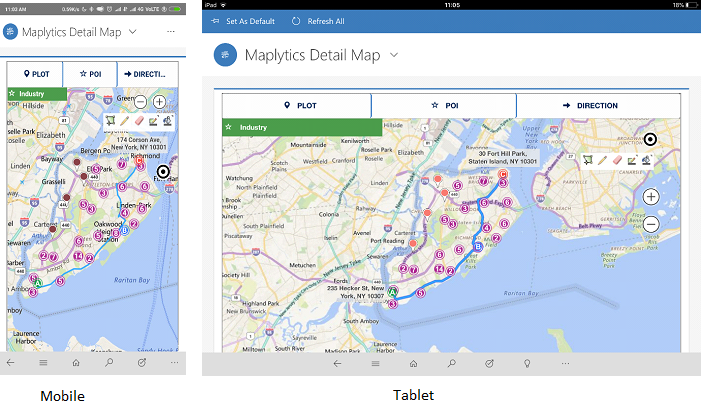 Once the users have plotted the route, they can use the ‘Route Redirect’ button to open the ‘Navigation Links’ popup on the browser as well as the Dynamics 365 App for Phones and Tablets. The user can click on individual links for route navigation from point A – B, B – C, and so on. The links redirect to the Google Maps site on desktop and Google Maps App on Phones and Tablets. The user can also use the ‘Copy Links’ button to copy the links to send them as an email or save it into a note. The links redirect on the Dynamics 365 App for Phones and Tablet works with Dynamics 365 v9.0 and is supported only on iOS devices. For other devices and Dynamics 365 v8.2, users can use the ‘Copy Links’ button. Heat Map visualization is extremely crucial for Field Sales and Service teams as it allows the Reps and Manager to gain a full geographical picture of their Sales and Service activities. They can further analyze the Heat Map visualizations to identify the regions that need attention. Heat Map was one of the features that we wanted to make more powerful and provide the users with functionalities that allow for better analysis and control over how the visualization is represented. So, we added two major enhancements to Heat Maps, ‘Summary Card’ and the ability to customize the ‘Color Scale for Heat Map Measure’. Now, every time the users create a Heat Map visualization, a ‘Summary Card’ summarizing the aggregate information for the complete heat map will open up. This gives the users a brief summary of the heat map they created. The measure is also summarized by default. The user can also click on any region plotted on the map to open the summary card for that region. To differentiate between the summary cards, the individual summary cards have the region name/number as the title. If the user has selected a field attribute in the ‘Filter’ drop-down, the summary card will further summarize the information for the selected category filter as well. 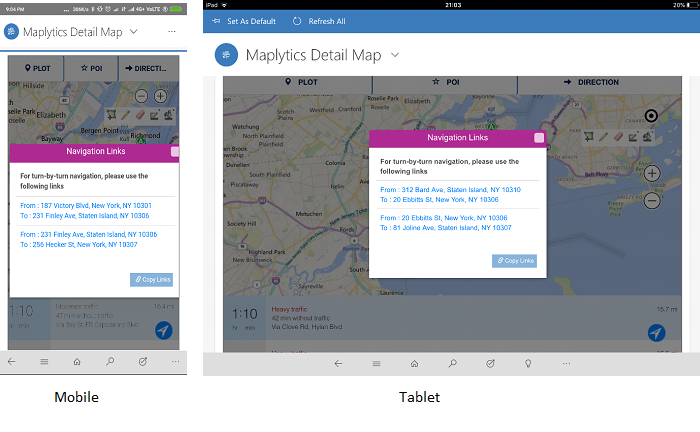 With the Dynamics 365 v9, Maplytics can also be accessed from the Dynamics 365 App for Phones, so making the Maplytics experience on Dynamics 365 App for Phones and Tablets was a natural decision. We looked at what we could offer on the mobile and tablet app, and it was a lot! Apart from the new ‘Concentric Proximity’, “Merged Route and Plot View’, Along the Route Search’, and ‘Route Redirect and Copy Links’ features, we also added some of the desktop exclusive features to the app as well. By Drawing and By Template Search options. Users can also ‘Save Template’ on the app. Users can also Save Routes and open the Saved Routes. 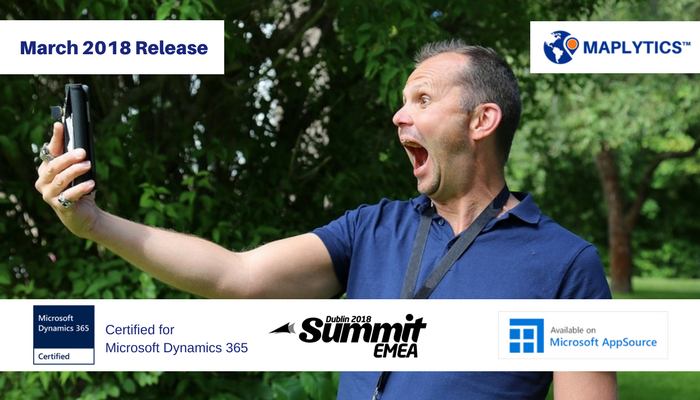 For Dynamics 365 v9, Maplytics can be accessed with the ‘Detail Map’ and ‘Map’ button on the Entity homepage and Entity Form as well. We are sure, these features will help a lot of users and would be a great addition to be more productive on the field. We will be releasing more articles and videos for each feature to further explore what can be achieved, so stay tuned and subscribe to our blog. If you can’t wait to get your hands on the latest features, download your 15 days free trial here.